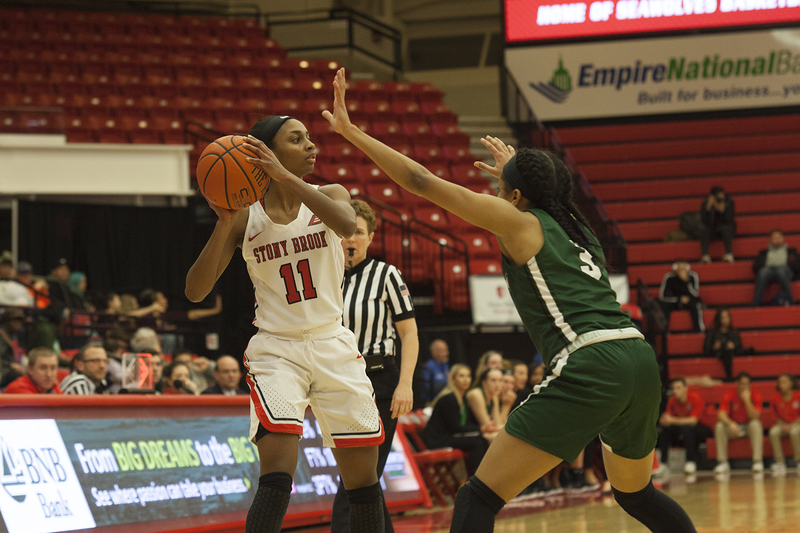 Four days after delivering a dominant 28-point victory over the Hofstra Pride, the Stony Brook women’s basketball team raised the bar. The Seawolves entered the home of the Manhattan Jaspers on Saturday, Nov. 17, and ran the court for four full quarters with a 31-point blowout win, 79-48. Senior guard Shania Johnson led the way in every offensive category for Stony Brook. Johnson tallied a season-high 23 points on 58 percent shooting, added seven assists and tied the team-high six rebounds. Sophomore forward India Pagan and senior guard Jerell Matthews tacked on 13 and 11 points, respectively. The Seawolves took control of the game with a series of runs in the first half. After allowing the first bucket of the game, a layup from junior guard Gabby Cajou, the Seawolves went on an 8-0 run. The Jaspers would tie things back up minutes later, but the run enabled the Seawolves to end the first quarter with a seven-point advantage. Stony Brook put the game away in the second quarter. Cajou sunk a free throw to start the quarter, and then the next 10 points were all scored by Seawolves. A minute later, after trading three points each, Stony Brook started a 12-point run that ballooned the lead to 40-15. Five different Seawolves scored points during this stretch, displaying a balanced attack that kept Manhattan constantly on its back foot. Manhattan did manage to hold even with the Seawolves in the third quarter, cutting the deficit from 26 to 25. Freshman guard D’yona Davis added six of her team-high 18 points in the third, creating a 3-point play on a foul and then draining a 3-point shot seconds later. Matthews and sophomore forward McKenzie Bushee iced the game in the fourth. Matthews scored five points in a minute by nailing two free throws and drilling a 3-pointer, and Bushee scored all six of her points in the final quarter via short shots. Stony Brook has a quick turnaround before its next game. The Seawolves return home on Tuesday, Nov. 20 to play against Georgia Southern at 7 p.m. The Eagles are 1-3 this year but are coming off their lone win, an 11-point victory over Savannah State.